So here you are, ready to learn all about this thing called AJAX. But, what exactly is it? The term AJAX refers to a loose grouping of technologies that are used to create dynamic, interactive web content. Similar techniques have been around in one form or another (often achieved with the help of some clever hacks) for quite a while. But the increasing availability of the XMLHttpRequest class in browsers, the coining of the catchy term AJAX, and the advent of a number of high-profile examples such as Google Maps, Gmail, Backpack, and Flickr, have allowed these kinds of highly interactive web applications to begin to gain traction in the development world. As the term AJAX has become more widespread, its definition has expanded to refer more generally to browser-based applications that behave much more dynamically than old-school web apps. This new crop of AJAX web applications make more extensive use of interaction techniques like edit-in-place text, drag-and-drop, and CSS animations or transitions to effect changes within the user interface. This tutorial will explain those techniques, and show you how to develop AJAX web applications of your own. This tutorial is an excerpt from my new book, Build Your Own AJAX Web Applications. In the three chapters presented here, we’ll discuss the basics of AJAX and learn how it ticks, before delving into the wonderful world of XMLHttpRequest. After we’ve played around with it, exploring its inner workings, making requests, and updating our application page asynchronously, we begin to develop our first true AJAX application. It’s going to be quite a ride, so I hope you’re ready for some adventure! If you’d rather read these chapters to offline, download the .pdf version of them. But now, let’s get a solid grounding in AJAX. He’s escaping, idiot! Dispatch War Rocket Ajax! To bring back his body! AJAX can be a great solution for many web development projects — it can empower web apps to step up and take over a lot of the ground that previously was occupied almost exclusively by desktop applications. All the same, it’s important to keep in mind that AJAX is not a sort of magic fairy dust that you can sprinkle on your app to make it whizzy and cool. Like any other new development technique, AJAX isn’t difficult to mis-use, and the only thing worse than a horrible, stodgy, old-school web app is a horrible, poorly executed AJAX web app. When you apply it to the right parts of your web application, in the right ways, AJAX can enhance users’ experience of your application significantly. AJAX can improve the interactivity and speed of your app, ultimately making that application easier, more fun, and more intuitive to use. Often, AJAX applications are described as being "like a desktop application in the browser." This is a fairly accurate description — AJAX web apps are significantly more responsive than traditional, old-fashioned web applications, and they can provide levels of interactivity similar to those of desktop applications. But an AJAX web app is still a remote application, and behaves differently from a desktop application that has access to local storage. Part of your job as an AJAX developer is to craft applications that feel responsive and easy to use despite the communication that must occur between the app and a distant server. Fortunately, the AJAX toolbox gives you a number of excellent techniques to accomplish exactly that. One of the first web development tasks that moved beyond serving simple, static HTML pages was the technique of building pages dynamically on the web server using data from a back-end data store. Back in the "bad old days" of web development, the only way to create this dynamic, database-driven content was to construct the entire page on the server side, using either a CGI script (most likely written in Perl), or some server component that could interpret a scripting language (such as Microsoft’s Active Server Pages). Even a single change to that page necessitated a round trip from browser to server — only then could the new content be presented to the user. In those days, the normal model for a web application’s user interface was a web form that the user would fill out and submit to the server. The server would process the submitted form, and send an entirely new page back to the browser for display as a result. So, for example, the completion of a multi-step, web-based "wizard" would require the user to submit a form — thereby prompting a round-trip between the browser and the server — for each step. Granted, this was a huge advance on static web pages, but it was still a far cry from presenting a true "application" experience to end-users. Early web developers immediately began to look for tricks to extend the capabilities of that simple forms-based model, as they strove to create web applications that were more responsive and interactive. These hacks, while fairly ad hoc and crude, were the first steps web developers took toward the kind of interactivity we see in today’s AJAX applications. But, while these tricks and workarounds often provided serviceable, working solutions, the resulting code was not a pretty sight. One way to get around the problem of having to reload the entire page in order to display even the smallest change to its content was the hideous hack of nesting framesets within other framesets, often several levels deep. This technique allowed developers to update only selected areas of the screen, and even to mimic the behavior of tab-style navigation interfaces in which users’ clicking on tabs in one part of the screen changed content in another area. This technique resulted in horrible, unmaintainable code with profusions of pages that had names like EmployeeEditWizardMiddleLowerRight.asp. The big drawback of this approach (beyond the fact that it was, after all, a hack) was the annoying burden of passing data back and forth between the main document and the document in the iframe. This is why AJAX development is such an enormous leap forward for web development: instead of having to send everything to the server in a single, huge mass, then wait for the server to send back a new page for rendering, web developers can communicate with the server in smaller chunks, and selectively update specific areas of the page based on the server’s responses to those requests. This is where the word asynchronous in the AJAX acronym originated. It’s probably easiest to understand the idea of an asynchronous system by considering its opposite — a synchronous system. In a synchronous system, everything occurs in order. If a car race was a synchronous system, it would be a very dull affair. The car that started first on the grid would be the first across the finish line, followed by the car that started second, and so on. There would be no overtaking, and if a car broke down, the traffic behind would be forced to stop and wait while the mechanics made their repairs. 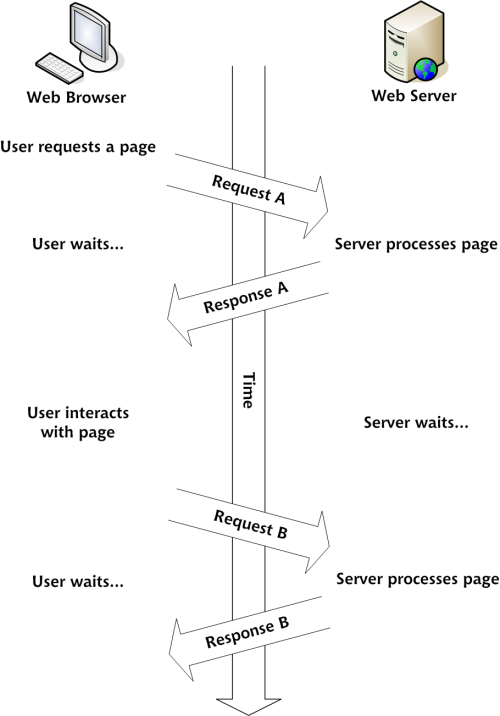 Traditional web apps use a synchronous system: you must wait for the server to send you the first page of a system before you can request the second page, as shown in Figure 1.1. An asynchronous car race would be a lot more exciting. The car in pole position could be overtaken on the first corner, and the car that starts from the back of the grid could weave its way through the field and cross the finish line in third place. The HTTP requests from the browser in an AJAX application work in exactly this way. It’s this ability to make lots of small requests to the server on a needs-basis that makes AJAX development so cool. 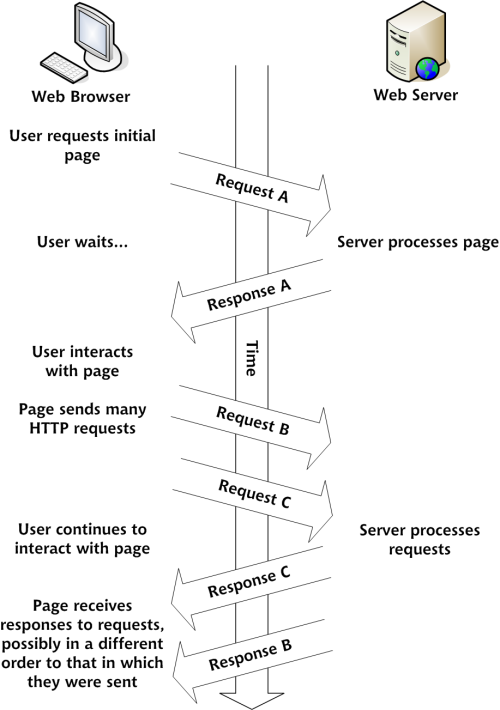 Figure 1.2 shows an AJAX application making asynchronous requests to a web server. The end result is an application that feels much more responsive, as users spend significantly less time waiting for requests to process, and don’t have to wait for an entire new web page to come across the wire, and be rendered by their browsers, before they can view the results. The technologies that are used to build AJAX web applications encompass a number of different programming domains, so AJAX development is neither as straightforward as regular applications development, nor as easy as old-school web development. Through the rest of this chapter, we’ll meet each of these technologies and discuss the roles they play in an AJAX web application. XML often serves as the main data format used in the asynchronous HTTP requests that communicate between the browser and the server in an AJAX application. This role plays to XML’s strengths as a neutral and fairly simple data exchange format, and also means that it’s relatively easy to reuse or reformat content if the need arises. It offers lots of standard tools and script libraries for viewing, editing, and validating XML. It’s forward-compatible with newer, XML-compatible browsers. It works with either the HTML Document Object Model (DOM) or the XML DOM. It’s more easily repurposed for viewing in non-browser agents. In practice, you can serve XHTML to the browser with a Content-Type of text/html, as all the mainstream browsers render correctly all XHTML documents served as text/html. Although browsers will treat your code as plain old HTML, other programs can still interpret it as XML, so there’s no practical reason not to "future-proof" your markup by using it. If you happen to disagree with me, you can choose instead to develop using the older HTML 4.01 standard. This is still a viable web standard, and is a perfectly legitimate choice to make in developing your web application. Most of the code examples in this book will use XHTML 1.0 Strict. The iframe element is not available in Strict, so the few code examples we show using the iframe will be XHTML 1.0 Transitional. The World Wide Web Consortium maintains an FAQ on the differences between HTML and XHTML. The Document Object Model (DOM) is an object-oriented representation of XML and HTML documents, and provides an API for changing the content, structure, and style of those documents. The DOM represents the structure of an XML or HTML document as an object hierarchy, which is ideal for parsing by standard XML tools. A great example of this is drag-and-drop functionality, which lets users drag pieces of the page around on the screen, and drop them into place to trigger specific pieces of functionality. This kind of feature used to exist only in desktop applications, but now it works just as well in the browser, thanks to the DOM. CSS (Cascading Style Sheets) provides a unified method for controlling the appearance of user interface elements in your web application. You can use CSS to change almost any aspect of the way the page looks, from font sizes, colors, and spacing, to the positioning of elements. In an AJAX application, one very good use of CSS is to provide user-interface feedback (with CSS-driven animations and transitions), or to indicate portions of the page with which the user can interact (with changes to color or appearance triggered, for example, by mouseovers). For example, you can use CSS transitions to indicate that some part of your application is waiting for an HTTP request that’s processing on the server. CSS manipulation figures heavily in the broader definition of the term AJAX — in various visual transitions and effects, as well as in drag-and-drop and edit-in-place functionality. I can’t wait to share this new wonder, The people will all see its light, Let them all make their own music, The priests praise my name on this night. It’s XMLHttpRequest that gives AJAX its true power: the ability to make asynchronous HTTP requests from the browser and pull down content in small chunks. Modern AJAX techniques, which use XMLHttpRequest, provide a huge improvement over these kludgy methods, allowing your app to make both GET and POST requests without ever completely reloading the page. In this chapter, we’ll jump right in and build a simple AJAX web application — a simple site-monitoring application that pings a page on a web server to a timed schedule. But before we start making the asynchronous HTTP requests to poll the server, we’ll need to simplify the use of the XMLHttpRequest class by taking care of all of the little browser incompatibilities, such as the different ways XMLHttpRequest objects are instantiated, inside a single, reusable library of code. One approach to simplifying the use of the XMLHttpRequest class would be to use an existing library of code. Thanks to the increasing popularity of AJAX development, there are literally dozens of libraries, toolkits, and frameworks available that make XMLHttpRequest easier to use. Stepping through the process of creating your own library will ensure you know how the XMLHttpRequest class works, and will help you get more out of those other toolkits or libraries when you do decide to use them. We’ll start by creating a basic class, called Ajax, in which we’ll wrap the functionality of the XMLHttpRequest class. Here, we create an instance of HelloWorld (called hw), then use this object to display two messages. The first time we call sayMessage, the default "Hello, world!" message is displayed. Then, after changing our object’s message property to "Goodbye," we call sayMessage and "Goodbye" is displayed. Don’t worry if this doesn’t make too much sense at the moment. As we progress through the building of our Ajax class, it will become clearer. This code just defines the properties we’ll need in our Ajax class in order to work with XMLHttpRequest objects. Now, let’s add some methods to our object. We need some functions that will set up an XMLHttpRequest object and tell it how to make requests for us. First, we’ll add an init method, which will create an XMLHttpRequest object for us. Unfortunately, XMLHttpRequest is implemented slightly differently in Firefox (in this book, whenever I explain how something works in Firefox, I’m referring to all Mozilla-based browsers, including Firefox, Mozilla, Camino, and SeaMonkey), Safari, and Opera than it was in Internet Explorer’s original implementation (interestingly, Internet Explorer version 7 now supports the same interface as Firefox, which promises to simplify AJAX development in the future), so you’ll have to try instantiating the object in a number of different ways if you’re not targeting a specific browser. Firefox and Safari create XMLHttpRequest objects using a class called XMLHttpRequest, while Internet Explorer versions 6 and earlier use a special class called ActiveXObject that’s built into Microsoft’s scripting engine. Although these classes have different constructors, they behave in the same way. Fortunately, most modern browsers (Internet Explorer 6, Firefox 1.0, Safari 1.2, and Opera 8, or later versions of any of these browsers) adhere to web standards fairly well overall, so you won’t have to do lots of browser-specific branching in your AJAX code. This usually makes a browser-based AJAX application faster to develop and deploy cross-platform than a desktop application. As the power and capabilities available to AJAX applications increase, desktop applications offer fewer advantages from a user-interface perspective. 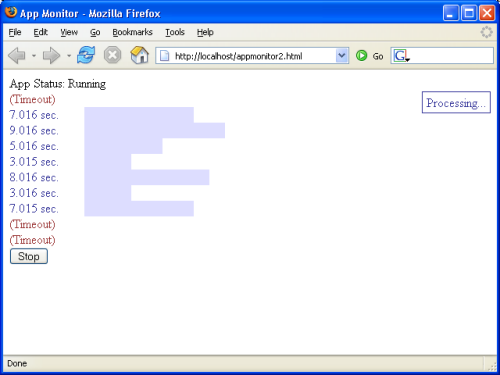 // Try to create object for Firefox, Safari, IE7, etc. // Try to create object for later versions of IE. // Try to create object for early versions of IE. // Could not create an XMLHttpRequest object. The init method goes through each possible way of creating an XMLHttpRequest object until it creates one successfully. This object is then returned to the calling function. Maintaining compatibility with older browsers (by "older" I mean anything older than the "modern browsers" I mentioned in the previous note) requires a lot of extra code work, so it’s vital to define which browsers your application should support. If you know your application will receive significant traffic via older browsers that don’t support the XMLHtmlRequest class (e.g., Internet Explorer 4 and earlier, Netscape 4 and earlier), you will need either to leave it out completely, or write your code so that it degrades gracefully. That means that instead of allowing your functionality simply to disappear in less-capable browsers, you code to ensure that users of those browsers receive something that’s functionally equivalent, though perhaps in a less interactive or easy-to-use format. This first part of doReq calls init to create an instance of the XMLHttpRequest class, and displays a quick alert if it’s not successful. 1. Method – This parameter identifies the type of HTTP request method we’ll use. The most commonly used methods are GET and POST. According to the HTTP specification (RFC 2616), the names of these request methods are case-sensitive. And since the methods described in the spec are defined as being all uppercase, you should always make sure you type the method in all uppercase letters. 2. URL – This parameter identifies the page being requested (or posted to if the method is POST). Normal browser security settings will not allow you to send HTTP requests to another domain. For example, a page served from ajax.net would not be able to send a request to remotescripting.com unless the user had allowed such requests. In our Ajax class, the method and async properties are initialized to reasonable defaults (GET and true), but you’ll always have to set the target URL, of course. 0: uninitialized – open has not been called yet. 1: loading – send has not been called yet. 2: loaded – send has been called, but the response is not yet available. 3: interactive – The response is being downloaded, and the responseText property holds partial data. 4: completed – The response has been loaded and the request is completed. An XMLHttpRequest object tells you about each change in state by firing a readystatechange event. In the handler for this event, check the readyState of the request, and when the request completes (i.e., when the readyState changes to 4), you can handle the server’s response. We’ll discuss how to "do stuff to handle response" in just a bit. For now, just keep in mind that you need to set up this event handler before the request is sent. The send method takes one parameter, which is used for POST data. When the request is a simple GET that doesn’t pass any data to the server, like our current request, we set this parameter to null. This code will create an instance of the ScopeTest class, then call that object’s doTest method, which will display the message "Greetings from ScopeTest!" Simple, right? Now, let’s add some simple XMLHttpRequest code to our ScopeTest class. We’ll send a simple GET request for your web server’s home page, and, when a response is received, we’ll display the content of both this.message and self.message. // This will only work in Firefox, Opera and Safari. So, what message is displayed? The answer is revealed in Figure 2.1. We can see that self.message is the greeting message that we’re expecting, but what’s happened to this.message? If this concept isn’t 100% clear to you yet, don’t worry too much about it. We’ll see an actual demonstration of this problem in the next chapter. In the meantime, just kind of keep in mind that if you see the variable self in code examples, it’s been included to deal with a loss-of-scope problem. Figure out if the response is an error or not. Prepare the response in the desired format. Pass the response to the desired handler function. When the response completes, a code indicating whether or not the request succeeded is returned in the status property of our XMLHttpRequest object. The status property contains the HTTP status code of the completed request. This could be code 404 if the requested page was missing, 500 if an error occurred in the server-side script, 200 if the request was successful, and so on. A full list of these codes is provided in the HTTP Specification (RFC 2616). If you have trouble remembering the codes, don’t worry: you can use the statusText property, which contains a short message that tells you a bit more detail about the error (e.g., "Not Found," "Internal Server Error," "OK"). responseText – This property contains the response from the server as a normal string. In the case of an error, it will contain the web server’s error page HTML. As long as a response is returned (that is, readyState becomes 4), this property will contain data, though it may not be what you expect. responseXML – This property contains an XML document object. If the response is not XML, this property will be empty. There’s one more option you can use if you want to get really fancy: you can return the actual XMLHttpRequest object itself to your handler function. This gives you direct access to things like the status and statusText properties, and might be useful in cases in which you want to treat particular classes of errors differently — for example, completing extra logging in the case of 404 errors. Implementations of XMLHttpRequest in all major browsers require the HTTP response’s Content-Type to be set properly in order for the response to be handled as XML. Well-formed XML, returned with a content type of text/xml (or application/xml, or even application/xhtml+xml), will properly populate the responseXML property of an XMLHttpRequest object; non-XML content types will result in values of null or undefined for that property. This method sets the mimeType property. // couldn't override MIME type  --  IE6 or Opera? Being able to override Content-Type headers from uncooperative servers can be very important in environments in which you don’t have control over both the front and back ends of your web application. This is especially true since many of today’s apps access services and content from a lot of disparate domains or sources. However, as this technique won’t work in Internet Explorer 6 or Opera 8, you may not find it suitable for use in your applications today. According to the HTTP 1.1 specification, any response that has a code between 200 and 299 inclusive is a successful response. The onreadystatechange event handler we’ve defined looks at the status property to get the status of the response. If the code is within the correct range for a successful response, the onreadystatechange event handler passes the response to the response handler method (which is set by the handleResp property). The response handler will need to know what the response was, of course, so we’ll pass it the response as a parameter. We’ll see this process in action later, when we talk about the doGet method. Since the handler method is user-defined, the code also does a cursory check to make sure the method has been set properly before it tries to execute the method. If the status property indicates that there’s an error with the request (i.e., it’s outside the 200 to 299 code range), the server’s response is passed to the error handler in the handleErr property. Our Ajax class already defines a reasonable default for the error handler, so we don’t have to make sure it’s defined before we call it. This method checks to make sure that pop-ups are not blocked, then tries to display the full text of the server’s error page content in a new browser window. This code uses a try ... catch block, so if users have blocked pop-ups, we can show them a cut-down version of the error message and tell them how to access a more detailed error message. Any function that’s passed as a parameter to setHandlerBoth will handle both successful responses and errors. This setup might be useful to a user who sets your class’s responseFormat property to object, which would cause the XMLHttpRequest object that’s used to make the request — rather than just the value of the responseText or responseXML properties — to be passed to the response handler. This method changes the onreadystate event handler to an empty function, calls the abort method on your instance of the XMLHttpRequest class, then destroys the instance you’ve created. That way, any properties that have been set exclusively for the request that’s being aborted are reset. Next time a request is made, the init method will be called and those properties will be reinitialized. So, why do we need to change the onreadystate event handler? Many implementations of XMLHttpRequest will fire the onreadystate event once abort is called, to indicate that the request’s state has been changed. What’s worse is that those events come complete with a readyState of 4, which indicates that everything completed as expected (which is partly true, if you think about it: as soon as we call abort, everything should come to a stop and our instance of XMLHttpRequest should be ready to send another request, should we so desire). Obviously, we don’t want our response handler to be invoked when we abort a request, so we remove the existing handler just before we call abort. You’ll notice that, along with the two expected parameters, url and hand, the function has a third parameter: format. This is an optional parameter that allows us to change the format of the server response that’s passed to the handler function. If we don’t pass in a value for format, the responseFormat property of the Ajax class will default to a value of text, which means your handler will be passed the value of the responseText property. You could, instead, pass xml or object as the format, which would change the parameter that’s being passed to the response handler to an XML DOM or XMLHttpRequest object. It’s finally time to put everything we’ve learned together! Let’s create an instance of this Ajax class, and use it to send a request and handle a response. This script gives us a shiny, new instance of the Ajax class. Now, let’s make it do something useful. You would want to make absolutely sure in this case that somepage.php was really serving valid XML and that its Content-Type HTTP response header was set to text/xml (or something else that was appropriate). Now that we have created the Ajax object, and set up a simple handler function for the request, it’s time to put our code into action. That’s all this little scrap of code does: it waits somewhere between three and 12 seconds, then prints ok. The fakeserver.php code sets the Content-Type header of the response to text/plain. Depending on the content of the page you pass back, you might choose another Content-Type for your response. For example, if you’re passing an XML document back to the caller, you would naturally want to use text/xml.
' There is no equivalent to sleep in ASP. Throughout this book, all of our server-side examples will be written in PHP, although they could just as easily be written in ASP, ASP.NET, Java, Perl, or just about any language that can serve content through a web server. Naturally, you should use this approach only when you’re certain that the response from the server will be valid XML, and you can be sure that the browser is Firefox or Safari. Now that all is well and our Ajax class is functioning properly, it’s time to move to the next step. We’ll use the start variable to record the time at which each request starts — this figure will be used to calculate how long each request takes. We make start a global variable so that we don’t have to gum up the works of our Ajax class with extra code for timing requests — we can set the value of start immediately before and after our calls to the Ajax object. The ajax variable simply holds an instance of our Ajax class. The doPoll function actually makes the HTTP requests using the Ajax class. You should recognize the call to the doGet method from our original test page. Notice that we’ve added to the target URL a query string that has the start value as a parameter. We’re not actually going to use this value on the server; we’re just using it as a random value to deal with Internet Explorer’s overzealous caching. IE caches all GET requests made with XMLHttpRequest, and one way of disabling that "feature" is to append a random value into a query string. The milliseconds value in start can double as that random value. An alternative to this approach is to use the setRequestHeader method of the XMLHttpRequest class to set the If-Modified-Since header on the request. Finally, we kick everything off by attaching doPoll to the window.onload event. This is all pretty simple: the function expects a single parameter, which should be the string ok returned from fakeserver.php if everything goes as expected. If the response is correct, the code does the quick calculations needed to figure out how long the response took, and creates a message that contains the result. It passes that message to pollResult for display. In this very simple implementation, anything other than the expected response results in a fairly terse and unhelpful message: Request failed. We’ll make our handling of error conditions more robust when we upgrade this app in the next chapter. The printResult function displays the message that was sent from showPoll inside the lone div in the page. Note the test in the code above, which is used to see whether our div has any child nodes. This checks for the existence of any text nodes, which could include text that we added to this div in previous iterations, or the text that was contained inside the div in the page markup, and then removes them. If you don’t remove existing text nodes, the code will simply append the new result to the page as a new text node: you’ll display a long string of text to which more text is continually being appended. The innerHTML property is not a web standard, but all the major browsers support it. And, as you can see from the fact that it’s a single line of code (as compared with the four lines needed for DOM methods), sometimes it’s just easier to use than the DOM methods. Neither way of displaying content on your page is inherently better. In some cases, you may end up choosing a method based on the differences in rendering speeds of these two approaches (innerHTML can be faster than DOM methods). In other cases, you may base your decision on the clarity of the code, or even on personal taste. The fact that the code continuously invokes the doPoll function means that once the page loads, the HTTP requests polling the fakeserver.php page will continue to do so until that page is closed. The pollHand variable is the interval ID that allows you to keep track of the pending operation, and cancel it using clearTimeout. The first parameter of the setTimeout call, doPoll, is a pointer to the main function of the application; the second represents the length of time, in seconds, that must elapse between requests. Here’s all the code from our first trial run with this simple monitoring application. Try loading the page in your browser. Drop it into your web server’s root directory, and open the page in your browser. If the fakeserver.php page is responding properly, you’ll see something like the display shown in Figure 2.3. Here are some online resources that will help you learn more about the techniques and concepts in this chapter. Here’s a good reference page from the Apple Developer Connection. It gives a nice overview of the XMLHttpRequest class, and a reference table of its methods and properties. 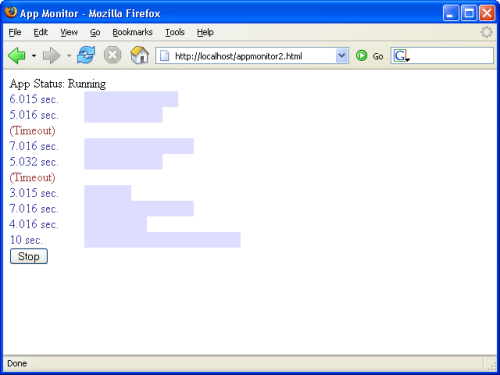 This is XULPlanet’s exhaustive reference on the XMLHttpRequest implementation in Firefox. Here’s another nice overview, which also shows some of the lesser-used methods of the XMLHttpRequest object, such as overrideMimeType, setRequestHeader, and getResponseHeader. Again, this reference is focused on implementation in Firefox. This is Microsoft’s documentation on MSDN of its implementation of XMLHttpRequest. XMLHttpRequest is at the heart of AJAX. It gives scripts within the browser the ability to make their own requests and get content from the server. The simple AJAX library we built in this chapter provided a solid understanding of how XMLHttpRequest works, and that understanding will help you when things go wrong with your AJAX code (whether you're using a library you've built yourself, or one of the many pre-built toolkits and libraries listed in Appendix A, AJAX Toolkits). The sample app we built in this chapter gave us a chance to dip our toes into the AJAX pool -- now it's time to dive in and learn to swim. It's flying over our heads in a million pieces. The "A" in AJAX stands for "asynchronous," and while it's not nearly as cool as the letter "X," that "A" is what makes AJAX development so powerful. As we discussed in Chapter 1, AJAX: the Overview, AJAX's ability to update sections of an interface asynchronously has given developers a much greater level of control over the interactivity of the apps we build, and a degree of power that's driving web apps into what was previously the domain of desktop applications alone. Back in the early days of web applications, users interacted with data by filling out forms and submitting them. Then they'd wait a bit, watching their browser's "page loading" animation until a whole new page came back from the server. Each data transaction between the browser and server was large and obvious, which made it easy for users to figure out what was going on, and what state their data was in. As AJAX-style development becomes more popular, users can expect more interactive, "snappy" user interfaces. This is a good thing for users, but presents new challenges for the developers working to deliver this increased functionality. In an AJAX application, users alter data in an ad hoc fashion, so it's easy for both the user and the application to become confused about the state of that data. The solution to both these issues is to display the application's status, which keeps users informed about what the application is doing. This makes the application seem very responsive, and gives users important guidance about what's happening to their data. This critical part of AJAX web application development is what separates the good AJAX apps from the bad. Figure 3.1 shows what the running application will look like once we're done with all the enhancements. All this new functionality will add a lot more complexity to our app, so this is a good time to establish some kind of organization within our code (a much better option than leaving everything in the global scope). After all, we’re building a fully functional AJAX application, so we’ll want to have it organized properly. We’ll use object-oriented design principles to organize our app. And we’ll start, of course, with the creation of a base class for our application — the Monitor class. This is a nice, normal constructor function, and we could easily use it to create a Monitor class (or a bunch of them if we wanted to). This is a problem because the object keyword this has a new meaning in the new execution context. So, when you use it within your class, it suffers from a sudden bout of amnesia — it has no idea what it is! Let’s change the doTest method so that it uses setTimeout to display the message in one second’s time. Instead of our greeting message, the alert box that results from this version of the code will read "undefined." Because we called onTimeout with setTimeout, onTimeout is run within a new execution context. In that execution context, this no longer refers to an instance of ScopeTest, so this.message has no meaning. The simplest way to deal with this problem of loss of scope is by making the Monitor class a special kind of class, called a singleton. Using the keyword new before function creates a "one-shot" constructor. It creates a single instance of ScopeTest, and it’s done: you can’t use it to create any more ScopeTest objects. There’s only one instance of ScopeTest, and we’re using its actual name instead of this, so there’s no confusion about which instance of ScopeTest is being referred to here. This looks a bit silly in a method that’s as short as that, but in longer chunks of code it’s nice to have a shorthand solution similar to this that you can use to refer to your object. I use self, but you could use me, or heyYou, or darthVader if you wanted to. The first four properties, targetURL, pollInterval, maxPollEntries, and timeoutThreshold, will be initialized as part of the class’s initialization. They will take on the values defined in the application’s configuration, which we’ll look at in the next section. ajax – The instance of our Ajax class that makes the HTTP requests to the server we’re monitoring. start – Used to record the time at which the last request was sent. pollArray – An array that holds the server response times; the constant MAX_POLL_ENTRIES determines the number of items held in this array. pollHand, timeoutHand – Interval IDs returned by the setTimeout calls for two different processes — the main polling process, and the timeout watcher, which controls a user-defined timeout period for each request. reqStatus – Used for the status animation that notifies the user when a request is in progress. The code that achieved this is fairly complicated, so we’ll be writing another singleton class to take care of it. The reqStatus property points to the single instance of that class. A webmaster looking at this application may think that it was quite cool, but one of the first things he or she would want is an easy way to configure the app’s polling interval, or the time that elapses between requests the app makes to the site it’s monitoring. It’s easy to configure the polling interval using a global constant. As well as initializing some of the properties of our class, the init method also calls two methods: toggleAppStatus, which is responsible for starting and stopping the polling, and the init method of the reqStatus object. reqStatus is the instance of the Status singleton class that we discussed a moment ago. Okay, so toggleAppStatus doesn’t really do the work, but it calls the methods that do: toggleButton, which changes Start buttons into Stop buttons and vice versa, and toggleStatusMessage, which updates the application’s status message. Let’s take a closer look at each of these methods. The only parameter to this method, stopped, can either be true, indicating that the polling has been stopped, or false, indicating that polling has started. As you can see in the code for this method, the button is created, and is set to display Start if the application is stopped, or Stop if the application is currently polling the server. It also assigns either pollServerStart or pollServerStop as the button’s onclick event handler. These event handlers will start or stop the polling process respectively. When this method is called from init (via toggleAppStatus), stopped is set to true so the button will display Start when the application is started. Showing a button with the word "Start" or "Stop" on it might be all that programmers or engineers need to figure out the application’s status, but most normal people need a message that’s a little clearer and more obvious in order to work out what’s going on with an application. This upgraded version of the application will display a status message at the top of the page to tell the user about the overall state of the application (stopped or running), and the status of the polling process. To display the application status, we’ll place a nice, clear message in the application’s status bar that states App Status: Stopped or App Status: Running. Once the UI is set up, the application is primed and ready to start polling and recording response times. Now that you’ve come this far, it would be nice to be able to see your work in action, right? Well, unfortunately, we’ve still got a lot of loose ends in our application — we’ve briefly mentioned a singleton class called Status but we haven’t created it yet, and we still have event handlers left to write. But never fear! We can quickly get the application up and running with a few class and function stubs. We’ll start by creating that Status singleton class with one empty method. Since the Status class is used by the Monitor class, we must declare Status before Monitor. Then, we’ll add our button’s onclick event handlers to the Monitor class. We’ll have them display alert dialogs so that we know what would be going on if there was anything happening behind the scenes. With these two simple stubs in place, your application should now be ready for a test-drive. When you click the Start button in the display shown in Figure 3.2 you’re presented with an alert box that promises greater things to come. Let’s get started making good on those promises. This code immediately calls the doPoll method, which, like the app monitor we built in Chapter 2, Basic XMLHttpRequest, will be responsible for making an HTTP request to poll the server. Once the request has been sent, the code calls toggleAppStatus, passing it false to indicate that polling is underway. You might wonder why, after all this talk about setting a poll interval, our code jumps right in with a request to the server; where’s the time delay? The answer is that we don’t want a time delay on the very first request. If users click the button and there’s a ten-second delay before anything happens, they’ll think the app is broken. We want delays between all the subsequent requests that occur once the application is running, but when the user first clicks that button, we want the polling to start right away. Our call to setTimeout instructs the browser to call handleTimeout once the timeout threshold has passed. We’re also keeping track of the interval ID that’s returned, so we can cancel our call to handleTimeout when the response is received by showPoll. The first thing this method does is cancel the delayed call to handleTimeout that was made at the end of doPoll. After this, we tell our instance of the Status class to stop its animation (we’ll be looking at the details of this a little later). After these calls, showPoll checks to make sure that the response is ok, then calculates how long that response took to come back from the server. The error handling capabilities of the Ajax class should handle errors from the server, so our script shouldn’t return anything other than ok … though it never hurts to make sure! Once it has calculated the response time, showPoll records that response time with updatePollArray, then displays the result with printResult. We’ll look at both of these methods in the next section. Now we’re ready to test our progress. 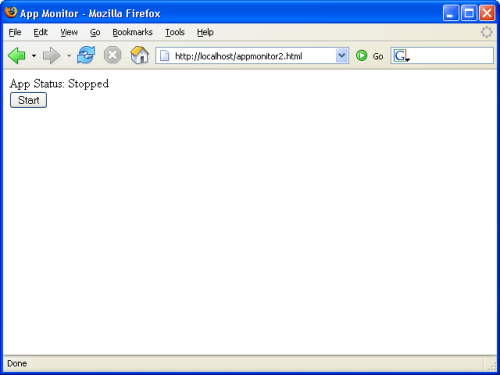 Open appmonitor2.html in your web browser, click Start, and wait for fakeserver.php to wake from its sleep and send ok back to your page. You can expect one of two outcomes: either a response is received by your page, and you see a dialog similar to the one shown in Figure 3.3, or you see the timeout message shown in Figure 3.4. Don’t worry if you receive the timeout message shown in Figure 3.4. Keep in mind that in our AJAX application, our timeout threshold is currently set to ten seconds, and that fakeserver.php is currently sleeping for a randomly selected number of seconds between three and 12. If the random number is ten or greater, the AJAX application will report a timeout. At the moment, we haven’t implemented a way to stop the polling, so you’ll need to stop it either by reloading the page or closing your browser window. If you’ve run the code we’ve written so far, you’ve probably noticed that even when a timeout is reported, you see a message reporting the request’s response time soon afterward. This occurs because handleTimeout is nothing but a simple stub at the moment. Let’s look at building on that stub so we don’t get this side-effect. Here, handleTimeout calls stopPoll to stop our application polling the server. It records that a timeout occurred, updates the user interface, and finally sets up another call to doPoll via doPollDelay. We moved the code that stops the polling into a separate function because we’ll need to revisit it later and beef it up. At present, the stopPoll method merely aborts the HTTP request via the Ajax class’s abort method; however, there are a few scenarios that this function doesn’t handle. We’ll address these later, when we create the complete code to stop the polling process, but for the purposes of handling the timeout, stopPoll is fine. Now, when we reload our application, the timeouts perform exactly as we expect them to. Now, to the meat of the new version of our monitoring app! We want the application to show a list of past response times, not just a single entry of the most recent one, and we want to show that list in a way that’s quickly and easily readable. A running bar graph display is the perfect tool for the job. The code is very straightforward, although some of the functions we’ve used in it have slightly confusing names. The unshift method of an Array object puts a new item in the very first element of the array, and shifts the rest of the array’s contents over by one position, as shown in Figure 3.5. When the array exceeds the user-defined maximum length, updatePollArray truncates it by "popping" an item off the end. This is achieved by the pop method, which simply deletes the last item of an array. (Note that the method name pop may seem quite odd, but it makes more sense once you understand a data structure called a stack, which stores a number of items that can be accessed only in the reverse of the order in which they were added to the stack. We "push" an item onto a stack to add it, and "pop" an item from a stack to retrieve it. The pop method was originally designed for developers who were using arrays as stacks, but here we’ve repurposed it simply to delete the last item in an array.) The reason why we append items to the top and remove items from the bottom of the array is that, in our display, we want the most recent entries to appear at the top, and older entries to gradually move down to the bottom. Once we’ve updated the results in pollArray, we can display them using the printResult method. This is actually the cool part: the user will experience first-hand the difference between our AJAX application and an older-style app that requires an entire page refresh to update content. In AJAX jargon, the chunk of the page that holds the list of response times is called a page partial. This refers to an area of a web page that’s updated separately from the rest of the page. Updating a chunk of a web page in response to an asynchronous request to the server is called "rendering a page partial." There’s quite a bit here, so let’s look at this method step by step. After initializing some variables, this method removes everything from pollDiv: the while loop uses removeChild repeatedly to delete all the child nodes from pollDiv. Next comes a simple for loop that jumps through the updated array of results and displays them. We generate a message for the result of each item in this array. As you can see below, timeouts (which are recorded as a 0) generate a message of (Timeout). The width of the bar div changes to reflect the actual response time, and timeouts are shown in red, but otherwise all entries in this list are identical. Note that you have to put something in the div to cause its background color to display. Even if you give the div a fixed width, the background color will not show if the div is empty. This is annoying, but it’s easy to fix: we can fill in the div with a non-breaking space character. This code may seem complicated if you’ve never used DOM manipulation functions, but it’s really quite simple. We use the well-named createElement method to create elements; then we assign values to the properties of each of those element objects. Just after the if statement, we can see the code that sets the pixel width of the bar div according to the number of seconds taken to generate each response. We multiply that time figure by 20 to get a reasonable width, but you may want to use a higher or lower number depending on how much horizontal space is available on the page. To add text to elements, we use createTextNode in conjunction with appendChild, which is also used to place elements inside other elements. In the code above, we create a non-breaking space using u00A0. If we try to use the normal &nbsp; entity here, createTextNode will attempt to be "helpful" by converting the ampersand to &amp;; the result of this is that &nbsp; is displayed on your page. The workaround is to use the escaped unicode non-breaking space: u00A0. The last piece of the code puts all the div elements together, then places the pollResult div inside the pollResults div. 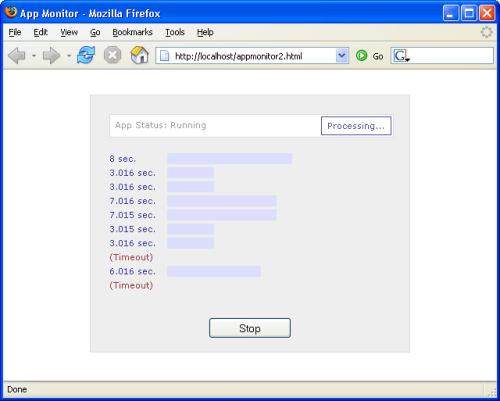 Figure 3.6 shows the running application. "Hold on a second," you may well be thinking. "Where’s the bar graph we’re supposed to be seeing?" The main point of interest in the CSS is the float: left declarations for the time and bar div elements, which make up the time listing and the colored bar in the bar graph. Floating them to the left is what makes them appear side by side. However, for this positioning technique to work, an element with the clearBoth class must appear immediately after these two divs. As an AJAX programmer, you can either try to depend on a library to take care of the CSS for you, or you can learn enough to get the job done. It’s handy to know someone smart who’s happy to answer lots of questions on the topic, or to have a good book on CSS (for example, SitePoint’s The CSS Anthology: 101 Essential Tips, Tricks & Hacks). Now that our CSS is in place, we can see the bar graph in our application display, as Figure 3.7 illustrates. The final action of the pollServerStart method, after getting the app running, is to call toggleAppStatus to toggle the appearance of the application. 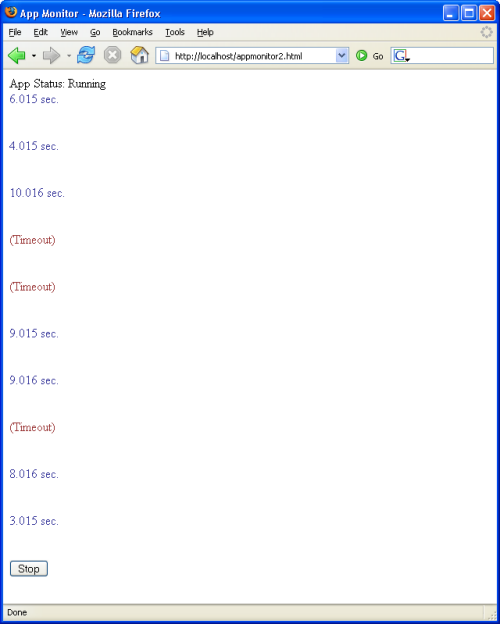 toggleAppStatus changes the status display to App Status: Running, switches the Start button to a Stop button, and attaches the pollServerStop method to the button’s onclick event. This code reuses the stopPoll method we added earlier in the chapter. At the moment, all that method does is abort the current HTTP request, which is fine while we’re handling a timeout. However, this method needs to handle two other scenarios as well. The first of these scenarios occurs when the method is called during the poll interval (that is, after we receive a response to an HTTP request, but before the next request is sent). In this scenario, we need to cancel the delayed call to doPoll. The second scenario that this method must be able to handle arises when stopPoll is called after it has sent a request, but before it receives the response. In this scenario, the timeout handler needs to be canceled. Now, you should be able to stop and start the polling process just by clicking the Start/Stop button beneath the bar graph. The ability of AJAX to update content asynchronously, and the fact that updates may affect only small areas of the page, make the display of status notifications a critical part of an AJAX app’s design and development. After all, your app’s users need to know what the app is doing. Back in the old days of web development, when an entire page had to reload in order to reflect any changes to its content, it was perfectly clear to end users when the application was communicating with the server. But our AJAX web apps can talk to the server in the background, which means that users don’t see the complete page reload that would otherwise indicate that something was happening. So, how will users of your AJAX app know that the page is communicating with the server? Well, instead of the old spinning globe or waving flag animations that display in the browser chrome, AJAX applications typically notify users that processing is under way with the aid of small animations or visual transitions. Usually achieved with CSS, these transitions catch users’ eyes — without being distracting! — and provide hints about what the application is doing. An important aspect of the good AJAX app design is the development of these kinds of notifications. Since we already have at the top of our application a small bar that tells the user if the app is running or stopped, this is a fairly logical place to display a little more status information. Animations like twirling balls or running dogs are a nice way to indicate that an application is busy — generally, you’ll want to display an image that uses movement to indicate activity. However, we don’t want to use a cue that’s going to draw users’ attention away from the list, or drive people to distraction as they’re trying to read the results, so we’ll just go with the slow, pulsing animation shown in Figure 3.8. This animation has the added advantages of being lightweight and easy to implement in CSS — no Flash player is required, and there’s no bulky GIF image to download frame by tedious frame. The far right-hand side of the white bar is unused space, which makes it an ideal place for this kind of notification: it’s at the top of the user interface, so it’s easy to see, but it’s off to the right, so it’s out of the way of people who are trying to read the list of results. This animation is now positioned to the right of the page. When you open the page in your browser, you won’t be able to see the animation — it’s nothing but a white box on a white background at the moment. If you’d like to, add some content to pollingMessage to see where it’s positioned. All the CSS gyrations with setInterval result in some fairly interesting and bulky code. So, as I mentioned before, it makes sense to put the code for the status animation into its own class — Status — that we can reference and use from the Monitor class. Some of the clever developers reading this may already have guessed that setInterval suffers from the same loss-of-scope problems as setTimeout: the object keyword this becomes lost. Since we have to deal with only one status animation in our monitoring application, it makes sense to take the expedient approach, and make our Status class a singleton class, just as we did for the Monitor class. The currOpacity property tracks the opacity of the pollingMessage div. We use setInterval to change the opacity of this div rapidly, which produces the pulsing and fading effect. The proc property is a three-state switch that indicates whether an HTTP request is currently in progress, has been completed successfully, or was aborted before completion. The procInterval property is for storing the interval ID for the setInterval process that controls the animation. We’ll use it to stop the running animation. The div property is a reference to the pollingMessage div. The Status class manipulates the pollingMessage div‘s CSS properties to create the animation. The init method also contains a call to a method named setAlpha, which is required for an IE workaround that we’ll be looking at a bit later. DOM element references (variables that point to div, td, or span elements and the like) that are used as class properties are a notorious cause of memory leaks in Internet Explorer. If you destroy an instance of a class without clearing such properties (by setting them to null), memory will not be reclaimed. If we don’t set that div reference to null, Internet Explorer will keep the memory it allocated to that variable in a death grip, and you’ll see memory use balloon each time you reload the page. In reality, this wouldn’t be much of a problem for our tiny application, but it can become a serious issue in large web apps that have a lot of DHTML. It’s good to get into the habit of cleaning up DOM references in your code so that this doesn’t become an issue for you. The currOpacity property of the object represents the opacity to which the pollingMessage div should be set. Our implementation uses an integer scale ranging from 0 to 100, which is employed by Internet Explorer, rather than the fractional scale from zero to one that’s expected by Mozilla and Safari. This choice is just a personal preference; if you prefer to use fractional values, by all means do. In the method, you’ll see a test for document.all — a property that’s supported only by IE and Opera — and a test for window.opera, which, unsurprisingly, is supported only by Opera. As such, only IE should execute the if clause of this if statement. Inside this IE branch of the if statement, the proprietary alpha.opacity property is used to set opacity, while in the else clause, we use the older MozOpacity property, which is supported by older Mozilla-based browsers. Finally, this method sets the opacity in the standards-compliant way: using the opacity property, which should ultimately be supported in all standards-compliant browsers. Internet Explorer version 6, being an older browser, suffers a couple of issues when trying to render opacity-based CSS changes. The addition of the background property fixes the first specific problem with Internet Explorer. We must set the background color of an element if we want to change its opacity in IE, or the text will display with jagged edges. Note that setting background to transparent will not work: it must be set to a specific color. This code, which executes only in Internet Explorer, uses the document.styleSheets array to iterate through each style sheet that’s linked to the current page. It accesses the rules in each of those style sheets using the rules property, and finds the style we want by looking at the selectorText property. Once it has the right style in the rules array, it gives the filter property the value it needs to change the opacity. Unfortunately, at the time of writing, even the latest version of Opera (version 8.5) doesn’t support CSS opacity, so such an animation does not work in that browser. However, this feature is planned for Opera version 9. After setting the proc property to proc (processing), this code calls the setDisplay method, which sets the color and content of the pollingMessage div. We’ll take a closer look at setDisplay next. Once the code sets the color and content of the pollingMessage div, it initializes the div‘s opacity to 100 (completely opaque) and calls displayOpacity to make this setting take effect. Finally, this method calls setInterval to schedule the next step of the animation process. Note that, as with setTimeout, the setInterval call returns an interval ID. We store this in the procInterval property so we can stop the process later. Stopping the animation smoothly requires some specific timing. We don’t want the animation to stop abruptly right in the middle of a pulse. We want to stop it in the natural break, when the "Processing …" image’s opacity is down to zero. So the stopProc method for stopping the animation doesn’t actually stop it per se — it just sets a flag to tell the animation process that it’s time to stop when it reaches a convenient point. This is a lot like the phone calls received by many programmers at the end of the day from wives and husbands reminding them to come home when they get to a logical stopping point in their code. This method does have to distinguish between two types of stopping: a successfully completed request (done) and a request from the user to stop the application (abort). The doProc method uses this flag to figure out whether to display the "Done" message, or just to stop. This method is dead simple — its main purpose is simply to reduce the opacity of the pollingMessage div by 10% every time it’s called. The first if statement looks to see if the div has completely faded out. If it has, and the animation is still supposed to be running, it resets the opacity to 100 (fully opaque). Executing this code every 90 milliseconds produces a smooth effect in which the pollingMessage div fades out, reappears, and fades out again — the familiar pulsing effect that shows that the application is busy doing something. If the animation is not supposed to continue running, we stop the animation by calling clearInterval, then, if the proc property is done, we trigger the "Done" animation with a call to startDone. This time, we pass true to setDisplay, which will change the text to "Done" and the color to green. We then set up calls to doDone with setInterval, which actually performs the fadeout. Finally, we’re ready to test this code in our browser. Open appmonitor2.html in your browser, click the Start button, and you should see a pulsing Processing … message near the top right-hand corner of the browser’s viewport, like the one shown in Figure 3.9. Be Careful with that Poll Interval! Now that we have an animation running in the page, we need to be careful that we don’t start the animation again before the previous one stops. For this reason, it’s highly recommended that you don’t set POLL_INTERVAL to anything less than two seconds. Our first working application showed how AJAX can be used to make multiple requests to a server without the user ever leaving the currently loaded page. It also gave a fairly realistic picture of the kind of complexity we have to deal with when performing multiple tasks asynchronously. A good example of this complexity was our use of setTimeout to time the XMLHttpRequest requests. This example provided a good opportunity to explore some of the common problems you’ll encounter as you develop AJAX apps, such as loss of scope and connection timeouts, and provided practical solutions to help you deal with them. That’s it for this excerpt from Build Your Own AJAX Web Applications — don’t forget, you can download this article in .pdf format. The book has eight chapters in total, and by the end of it, readers will have built numerous fully functioning web apps including an online chess game that multiple players can play in real time — the book’s Table of Contents has the full details.